New York (TADIAS) – A few years ago the Fine Arts School at Addis Ababa University, which consists of the School of Music, the School of Theater Arts and the School of Fine Arts & Design, was renamed the Skunder Boghossian College of Performing and Visual Arts in honor of the institution’s most influential former professor of contemporary art and one of Ethiopia’s renown artists. Since 2003 photographer Gediyon Kifle has been documenting Skunder’s paintings held in private collections around the world. Gediyon, who is scheduled to speak at a symposium in Washington, D.C. on September 22nd, 2013 marking the launch of the Skunder Boghossian Fellowship Award, said that he is also working on a documentary film and photo book highlighting the life and work of the legendary artist. Skunder, who lived most of his life in the United States, briefly taught at Addis Ababa University in the late sixties (1966 – 1969) after returning home from an 11-year stay in Europe. Sponsored by the Ethiopian government, Skunder had attended Saint Martin’s School of Art in the U.K. in 1955 at the age of 18. He also studied at Slade School of Fine Art while in London. Two years later he moved to France continuing his studies for nine more years at Academie de la Grande Chaumiere in Paris. He arrived in the U.S. in 1970 and accepted a teaching position at Howard University in 1972 that lasted until 2001, two years before he passed away at age 65. 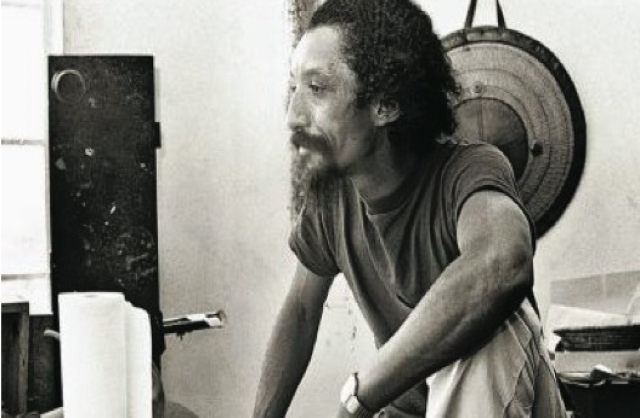 Skunder became the first contemporary African artist to have his work acquired by the Museum of Modern Art in New York in 1966 when MOMA purchased his 1964 painting entitled Juju’s Wedding. His last commissioned work was in 2001, a team project in collaboration with U.S.-based Ethiopian painter and art professor, Kebedech Tekleab, on the Nexus for the Wall of Representation at the Ethiopian Embassy in Washington, D.C.
Skunder’s work has been represented by the Contemporary African Art Gallery in Manhattan, New York since the late 1990s. “I have a small room in the gallery that is completely dedicated to Skunder’s painting where I keep a collection,” said gallery owner Bill Karg, in a recent phone conversation. “He has done a total of three solo exhibition here,” Bill recalled. “But his first show at the gallery was in 1997.” Since then, Bill has kept the relationship through Skunder’s daughter Aida Boghossian, and opens his collection for customers periodically and by appointment.